No we are not in some ashram in India but just a few villages away from where we live. I’d heard of the remarkable baba from friends and was introduced to him the other day. 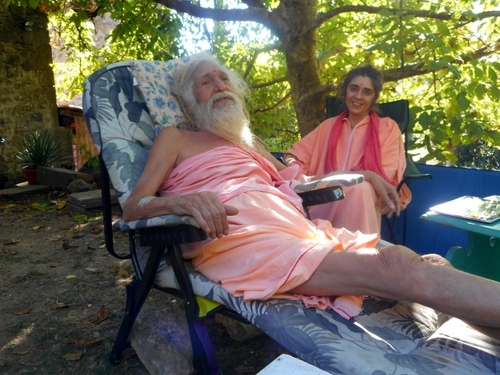 Baba Cesare, who was born in Turin, has an ashram in that city of cities Vijayanagar, otherwise known as Hampi, but comes to Italy for the summer when temperatures rise immeasurably in that central part of the Deccan. A baba, or sadhu, is a person who has renounced the world. His town is the forest, his home is a cave, his bed is the living earth and he drinks water only from rivers. Owning nothing the Sadhu is completely liberated, standing even outside India’s caste system or our own more egalitarian, but still hierarchical, social classes. The sadhu is beyond aspirations of ambition, superiority or power. I felt a true affinity with Baba Cesare and returned to that India I had experienced as a teenager when I hitched on the hippie trail to Kathmandu and later, too, when I returned to such places as Rishi-Kesh and the magic mountains of Gujarat. Most of all I returned to the city of Victory, Vijayanagar, one of the most incredibly beautiful places on earth – a place I visited a long time ago with a now long-lost girl-friend who declared it an earthly paradise. 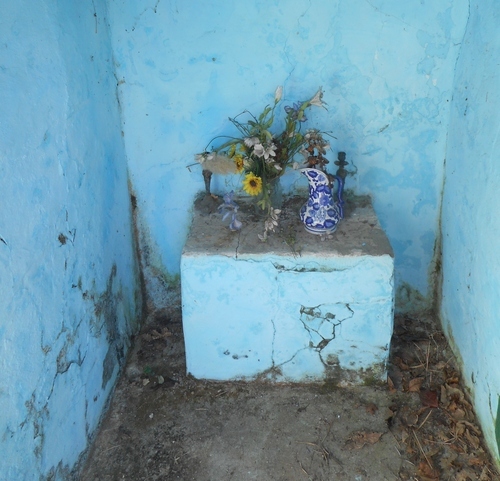 Interestingly, there’s a little catholic shrine in the village which strangely reminded me of some village shrines in India in its endearing simplicity. I returned to Baba the following morning to participate in his puja. I was asked to accompany a hymn to Shiva on the tabla (drums). There were just four of us there: Baba’s assistant, a local friend and a lovely Tibetan dog. It was a fresh start at 8.30 to a day which would increasingly become hotter and hotter. Baba’s life is worthy of a sequel to Hesse’s wonderful novel ‘Siddhartha’. The Italian journalist, Folco Terzani, son of the distinguished late Tiziano (one of the very few western journalists to witness the fall of Saigon to the Viet-Cong and that of Phnom Penh to the Khmer rouge), met him, shared his story and in 2012 published a book, ‘A piedi scalzi sulla terra’, also available in English as ‘Barefoot on the Earth’. I’ve just started to read it and it’s a fascinating mixture of adventure story, spiritual journey and investigation of the world revealed in Baba’s stimulating thoughts on the ultimate meaning of life (if there is one…). The proof that one has reached the highest level of enlightenment of Nirvana as a sadhu is that one can depart either to the local village store or to the sacred lakes of the Himalayas with the same preparation and the same attitude. There’s no need to make a list of what has to bring, no lengthy cogitations on reading up things – just go and just return with the same spontaneity, with the same thoughtlessness beyond thought, because one is completely embraced and protected by the hands of the Godhead. I think I still have a little way to go before reaching that stage – one thing is certain, however: for the greatest journey we shall all have to make at the end of our lives we will need nothing at all….. This entry was posted in Appennines, Event, Religion, Val di Lima by Francis. Bookmark the permalink. 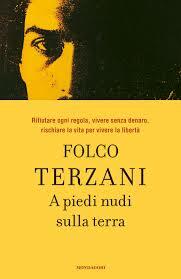 I couldn’t find the English copy of “Barefoot on the Earth” by Folco Terzani. Do you have any idea where we could obtain the English translation of the book? Theres only one copy and it hasnt been published yet. I am looking forward to the release of the new book. Baba Cesare will be sorely missed by us all he was a great uplifting personality a most humble person who lived his life in utter connection to life’s consciousness in simplicity Nature and prayer. We would have loved to have visited him in his beloved Ashram at Hampi India maybe we will fulfill that journey in the future meanwhile may he Rest in Peace with all that he believed and loved on this Planet Earth. Wherever you are Baba Cesare I am so grateful for our fleeting visit just recently I feel blessed to have had the honour of meeting you and your helper and embibing a refreshing Chai with herbs. Baba Cesare you are such a gentle soul a holy person we will miss you thank you so very much for your upliftment in that often sad valley your presence brought a ray of hope and sunshine into the area which was so needed by us mere mortals.